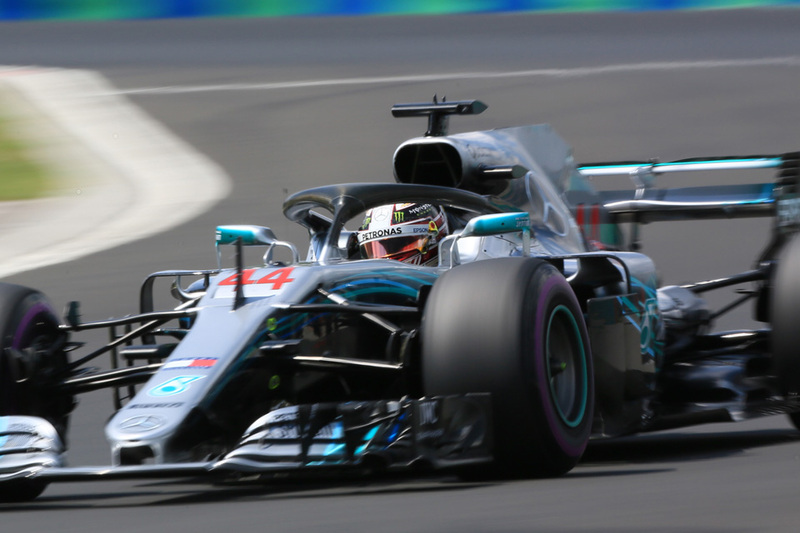 "This is probably one of the weakest F1 circuits for me, if not the weakest..."
So said Lewis Hamilton early in this Russian Grand Prix weekend. And while there were conspicuous adventures along the way, he still managed to exit the round with his championship lead extended yet further. Now it's 50 points over Sebastian Vettel with five races left. And again on a weekend many thought in advance would be one of damage limitation. While Singapore last time out we reckoned wouldn't suit Mercedes, Sochi this time out we reckoned may not suit Mercedes and more likely wouldn't suit Hamilton personally. 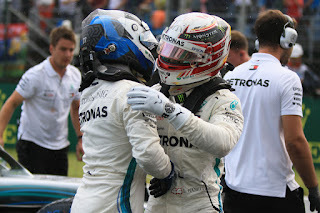 But, in keeping with F1's theme of recent weeks, Mercedes and Hamilton somehow got the result. For the title number five on offer we're now in something like the endgame. This time, in a minor variation, Ferrari was off the Mercedes pace fundamentally. Come the race it had a glimpse though, as Vettel successfully executed an undercut at the solitary stops to get ahead of Hamilton for a net second place behind poleman and track specialist Valtteri Bottas in the other Merc. But in keeping with how things have been going for the Scuderia lately the joy was fleeting. Hamilton dived back past at turn four a lap later in a fine move. Vettel chased gamely from then on but wasn't especially a threat again. From then on a couple of stories remained, one more positive than the other. 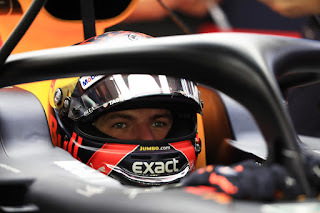 Max Verstappen had started 19th of 20 due to technical grid penalties but in the race rose at a scarcely credible rate. 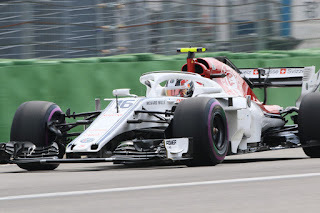 He was up to fifth by lap eight and even better was on a contra-strategy, starting on the harder tyre, letting him lead for a long time after the nominal front-runners pitted. "How the heck did that happen?," as Nico Hulkenberg asked aptly when advised it would be Max first through to lap him. 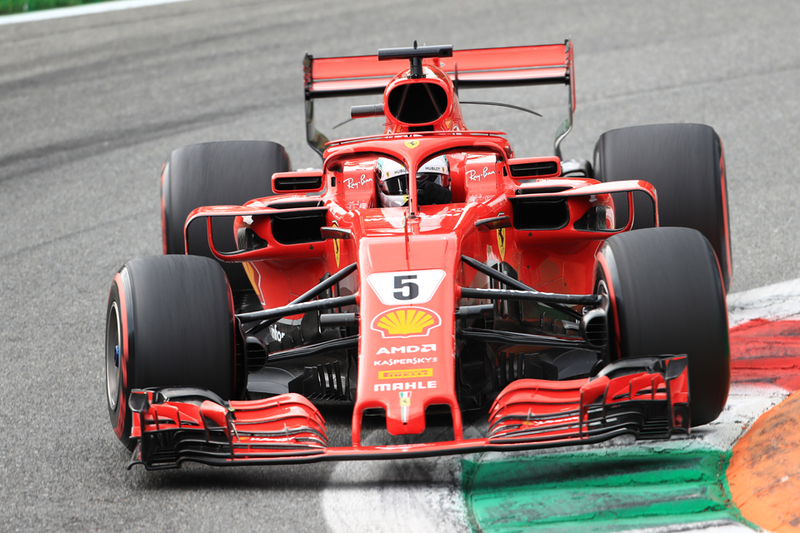 He pitted finally for ultra-softs with 11 laps left and most anticipated some whizz-bang times to chase down fourth-placed Kimi Raikkonen, but they never materialised. He finished fifth some way ahead of his similarly low-starting team-mate Daniel Ricciardo, whose first lap progress was slower then he was hobbled by a damaged front wing after hitting debris, costing him significant downforce. The other story was more familiar. From Mercedes's point so of view, which is from the angle of winning a championship, the wrong Merc was ahead. So the question lingered of whether Bottas - who had not put a foot wrong from pole - would be required to yield to Hamilton behind. Sure enough at around half distance Bottas got the phone call. The matter was muddied a bit by Verstappen being ahead - Hamilton was being backed into Vettel in the queue and the Merc team also claimed to be concerned about a Hamilton tyre blister. Whatever though the move got in response the usual round of hand-wringing - and moral objection from plenty whom it eludes when it benefits their own driver (as well as there being the vice versa that plenty who get outraged at other teams doing it were being quiet today). Bottas didn't sound thrilled to cede the place, and from his words it also wasn't clear the extent he'd been forewarned about what would happen in this entirely foreseeable scenario. But from the title perspective mentioned it made perfect sense. Fifty points sounds a lot more comfortable than 43, particularly if your rival could still have a car advantage. And remember it was just two rounds ago that we were criticising Ferrari for not playing the team game. Even Vettel called the switch a "no-brainer". The mood though afterwards was muted; the sense of moral conflict in the Mercedes camp clear. Boss Toto Wolff admitted it was a "difficult day" for all concerned, a term echoed afterwards by Hamilton. “It's actually quite a difficult day," Hamilton said. 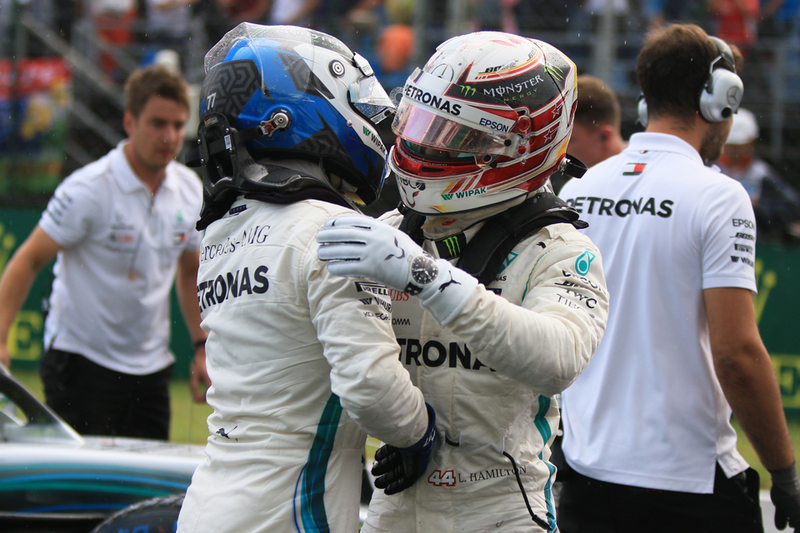 "Valtteri did a fantastic job all weekend and he was a real gentleman to let me by. Obviously he is not fighting for the championship, whereas we are. "It's just been such a great weekend for the team. The team have done such an exceptional job to have this advantage on Ferrari and to have a one-two. Usually you would be just elated, but I can understand how difficult it is for Valtteri but really he did a fantastic job today and he deserved to win. "But championship-wise, as a team we are trying to win both championships and I think today it was a real team effort. Whilst it doesn't feel spectacular, I know he is going to do great in the following races to come." Hamilton expanded elsewhere that he'd argued against the team order. "They told me on the radio that Valtteri was going to let me go, which is not what I wanted," he added. A subdued Bottas echoed the term too. "Yeah, difficult day," he said as well. "Obviously a good result for us as a team; we got maximum points. But personally, as everyone saw, it was quite a difficult race. “For sure we always go through all the scenarios [before the race], all the facts. Lewis is now fighting for the championship and we are fighting for the constructors', so we always have a plan, but yeah...it's always difficult to predict what’s going to happen in the race, how it is going to go, but it is what it is." "We are all racers at heart," added Wolff, "and what we want to see is out and out racing and may the quickest man win. And then we are a bunch of rational guys, and we discuss things in the morning and then everything is different in the race. "This is what happened today. We should be over the moon with a one-two, and fundamentally we are, but we also feel it went against Valtteri. It would have been a race win for him, and we changed it. "Valterri is such a tremendous team player." And the bottom line is Hamilton won with Bottas between him and Vettel and the Englishman's title lead now looks as good as insurmountable. Behind the usual suspects Ferrari-bound Charles Leclerc performed formidably to finish as best of the rest in seventh as well as to be the only one out of the charmed circle not to be lapped, showing pace that stunned at least one 'Class B' rival behind. Also Leclerc's result means six of the seven 'midfield' teams have now taken a 'Class B win' in 2018. So at least one part of F1 is competitive. Leclerc was set up for his recent with a great early move on Kevin Magnussen's Haas, who finished eighth. The Force India pair with Esteban Ocon ahead filled the final two scoring places - the Silverstone team applied its own team order by letting Sergio Perez ahead but switching back when Checo couldn't make further progress. The intra-team clash in Singapore heightened the Force India management's desire to control things. It was one of the better races we've seen at Sochi, although you may point out that is not saying much. But as outlined, sadly, the focus was elsewhere nevertheless. For Mercedes it was a bittersweet symphony. Yet if and when its 2018 championships are secured the music then will sound no less sweet.